The CSV Editor form component allows for the editing of CSV-formatted tabular data, such as a spreadsheet. 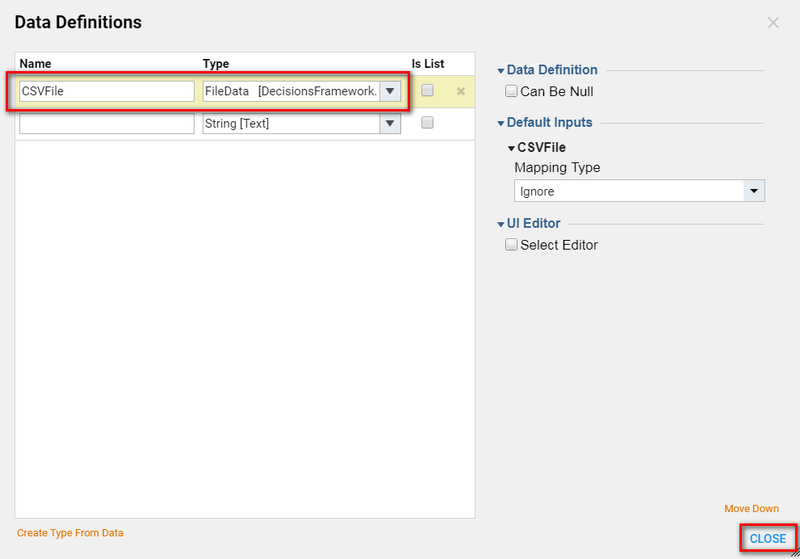 To use the CSV Editor	in a flow, first create a form in the Form Designer and drag the CSV Editor	component to the workspace from the File Handling	category of the Toolbox	panel. 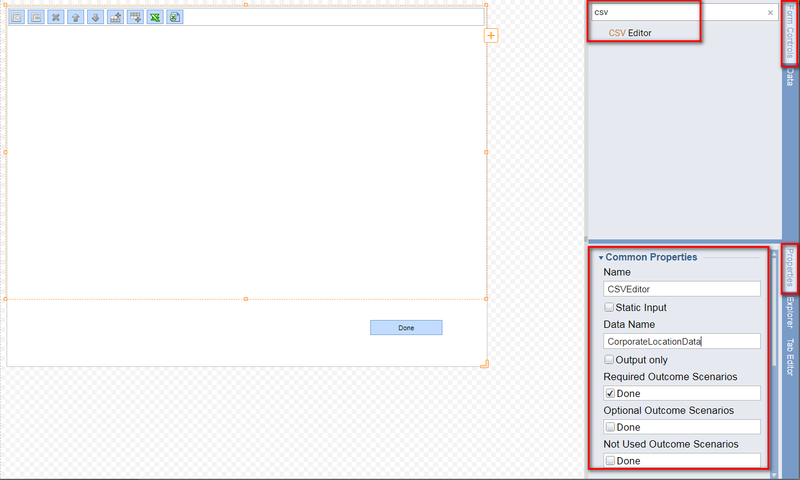 Then, in the Flow Designer , configure the data inputs and outputs of the form step. 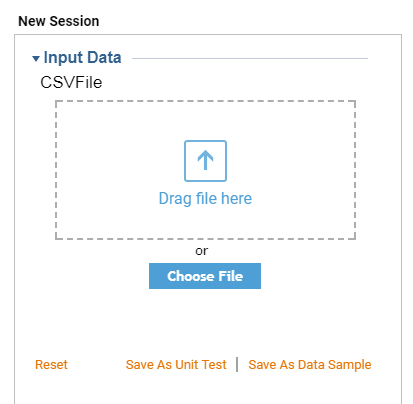 This example will create a form containing a CSV Editor	, then create a flow that maps the inputs and outputs of the form. 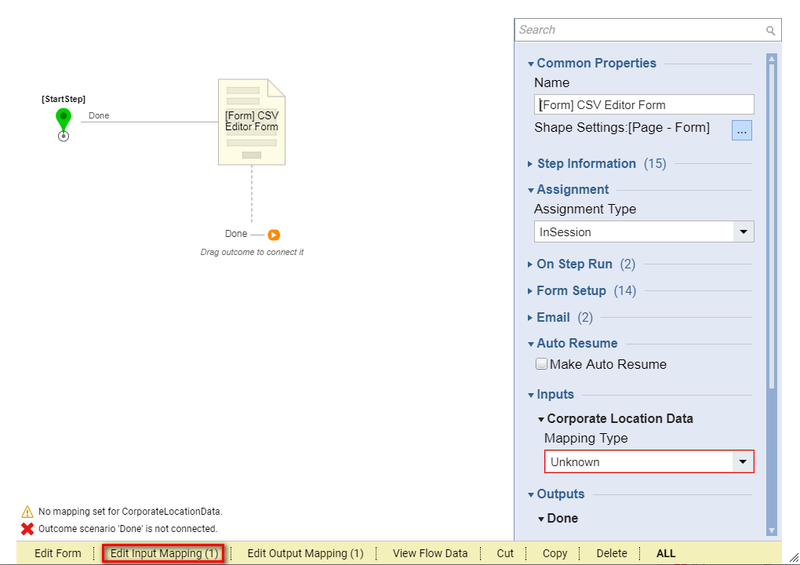 Begin in the portal by navigating to a Designer Folder	and clicking the Create Form	button. 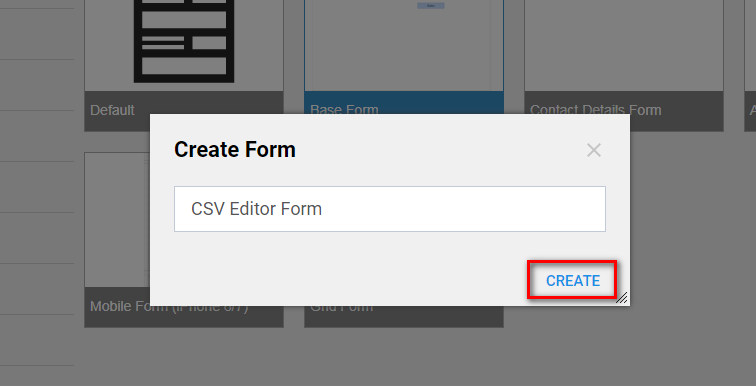 In the resulting New Form pop-up, name the form and click OK	to open it in the Form Designer . This completes our form. Save and close the Form Designer . Back in the Designer Folder	, click the New Flow	button. In the resulting New Flow pop-up, give a name to the flow and click OK	to open it in the Flow Designer . 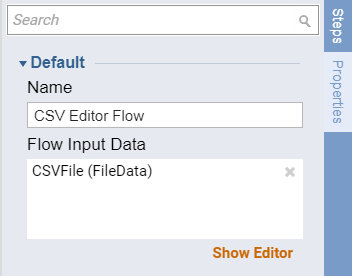 Add the CSV Editing form in our flow by dragging CSV Form	to the workspace from the Flows, Rules, Forms and Reports > Forms	[Interaction] > [Current Folder]	category of the Flow Designer&apos;s start-up window. Click Add	to add this step to the workspace. 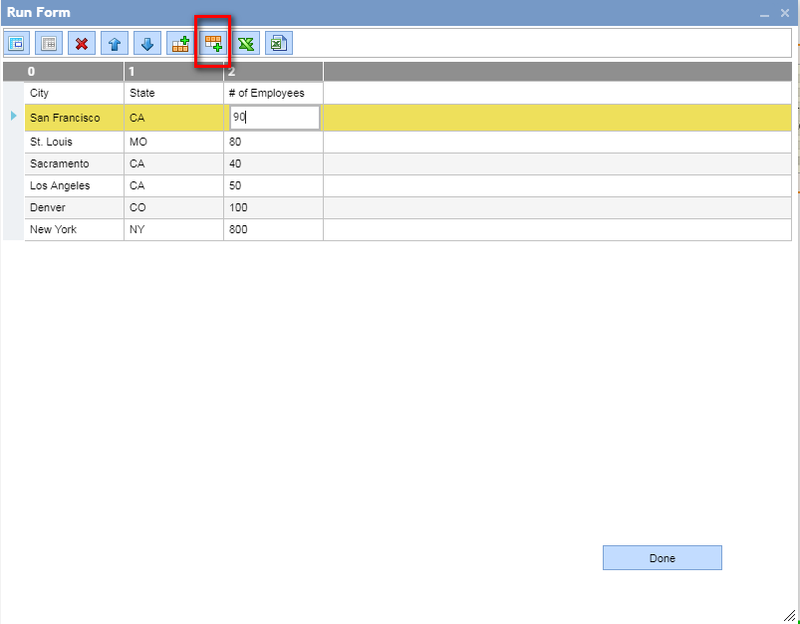 Next, click in the workspace so that when the Properties	panel is selected, the Flow Data input option appears. 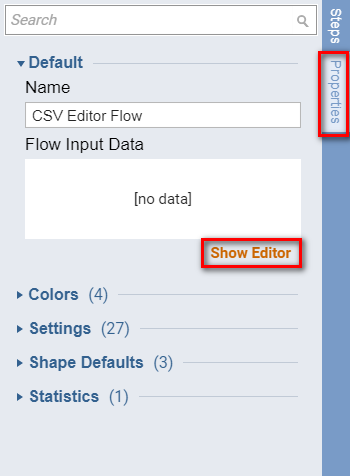 In the Properties	panel, under Flow Data > Flow Input Data	, click the Add	button. In the resulting Edit object pop-up, enter "CSVFile" in the Name	field and click the Type	selector. Select the type FileData	and click OK	.
We&apos;ll save the input type by clicking the Save	button in the Edit object pop-up . Next, click on the form step and, in the Properties	panel, click theInput Mapping Editor	link. In the Mapping Editor , map the flow&apos;s data input - Csv file	- to our form&apos;s data input - Csv file	, and click OK	to close the Mapping Editor . Connect the form to the End	step. This completes our example flow. 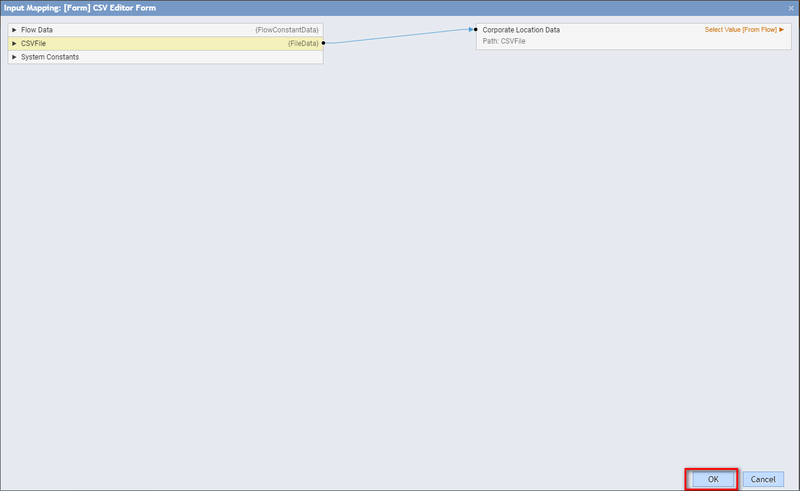 Click the Debug	Flow	link to see it in action. The Debugger prompts for a file to use as input. Click the Choose File	selector and, in the resulting Open pop-up, select the file and then click Open	. 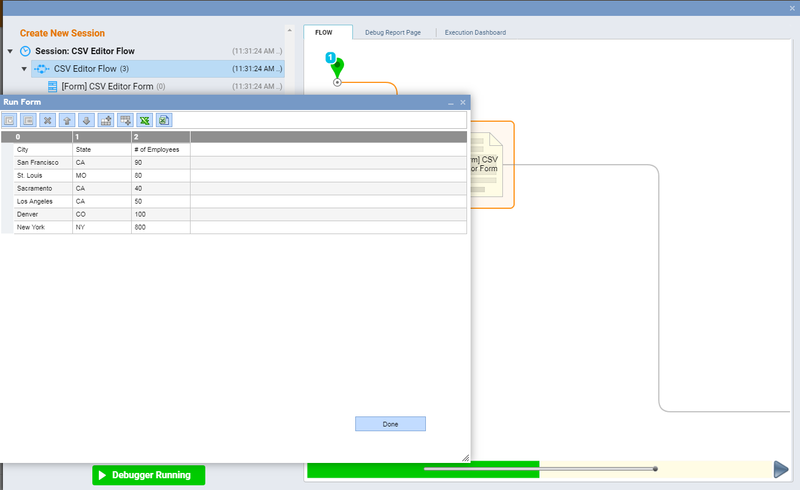 Click the Run without Save	button to run our flow in the debugger. The CSV Form	appears under the Form	tab. To edit the data, click any cell in the table. To add a new row, click one of the Add Row	buttons. To save the updated CSV file, click the Save Excel File	button.